This guide will walk you through which type of laminate flooring is best for you, along with some basic installation and maintenance tips. Many laminates look like and mimic the texture of real hardwood, stone and tile, and are available in a variety of finishes. 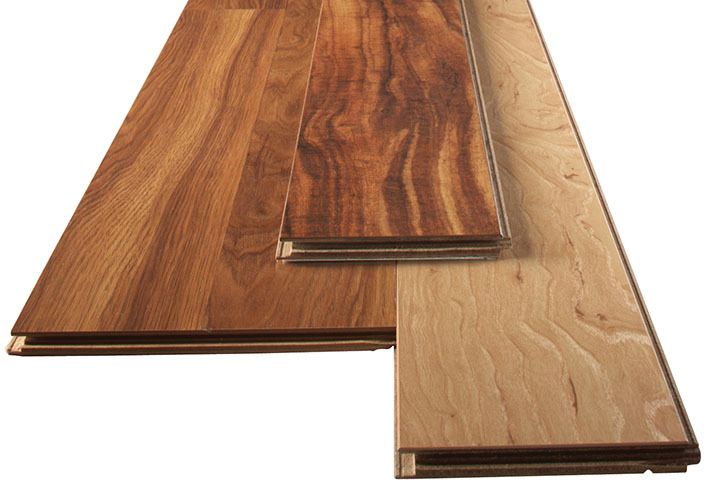 Sold in planks or tiles, laminate connects with an interlocking tongue-and-groove system. It can be removed easily to change styles, and repairs are seamless. Tip: Laminate floors require a thin underlayment, which creates the realistic sound of walking on a hardwood floor and feels softer underfoot. Some laminates have a pre-attached underlayment for easy installation and noise reduction. Laminate floors can be installed directly over most existing surfaces, including wood, vinyl, tile and more. It can be walked on immediately after installation, and many laminates use a glue-free method that makes installation fast and simple with no need for drying time. Laminate is a floating floor, so it requires a small expansion space around the perimeter of the room to allow for movement with changes in humidity. This space can be covered with coordinating wall base and quarter round to beautifully finish your room. A damp mop or duster is all you’ll need for everyday cleaning, and laminate cleaners are available for spot cleaning. No wet mopping or waxing is ever needed. Use door mats at exterior doorways to reduce wear on the surface of the floor. Always use floor protectors or casters on furniture legs to prevent scratching. Do not allow liquid to stand on the floor; wipe up spills immediately. Small nicks and scratches are easily covered with laminate finishing putty.